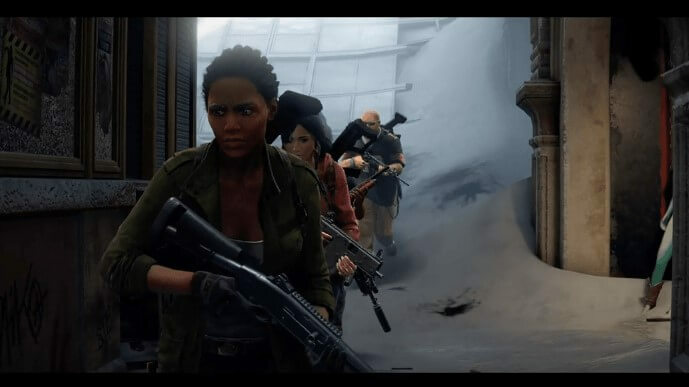 Developer Saber Interactive and Publisher Focus Home Interactive have released a brand new trailer for its up and coming game World War Z, inspired by the Paramount Pictures blockbuster action film, World War Z. The new trailer is named as 'Players vs Players vs Zombies (PvPvZ)'. The new trailer 'PvPvZ' showcases the exciting gameplay of the Players vs Players vs Zombies of the World War Z. World War Z features five unique modes. The new trailer showcases team based combat as well as the new unique mode PvPvZ, which delivers completely different experience, you fight both the living and the dead over an assortment of aggressive modes intended for 4v4 battle. "PvPvZ offers a completely unique experience, challenging you to outlive both the living and the dead across a variety of competitive modes designed for 4v4 combat. - Vaccine Hunt: players must pick up and hold an object to earn point for the team. Powered by Saber’s dynamic Swarm Engine™, World War Z unleashes hundreds of fast-moving, bloodthirsty zombies at a time on players in a nail-biting action experience around the world, including New York, Moscow, Jerusalem and more. Play in co-op with up to 3 friends using six distinct classes and an arsenal of deadly weapons, explosives, turrets and traps to demolish the undead menace and survive another day." Saber Interactive also recently tweeted on twitter that they will be announcing the release date for World War Z really soon. World War Z is anticipated to launch in 2019 on PlayStation 4, Xbox One and PC via Epic Games store.